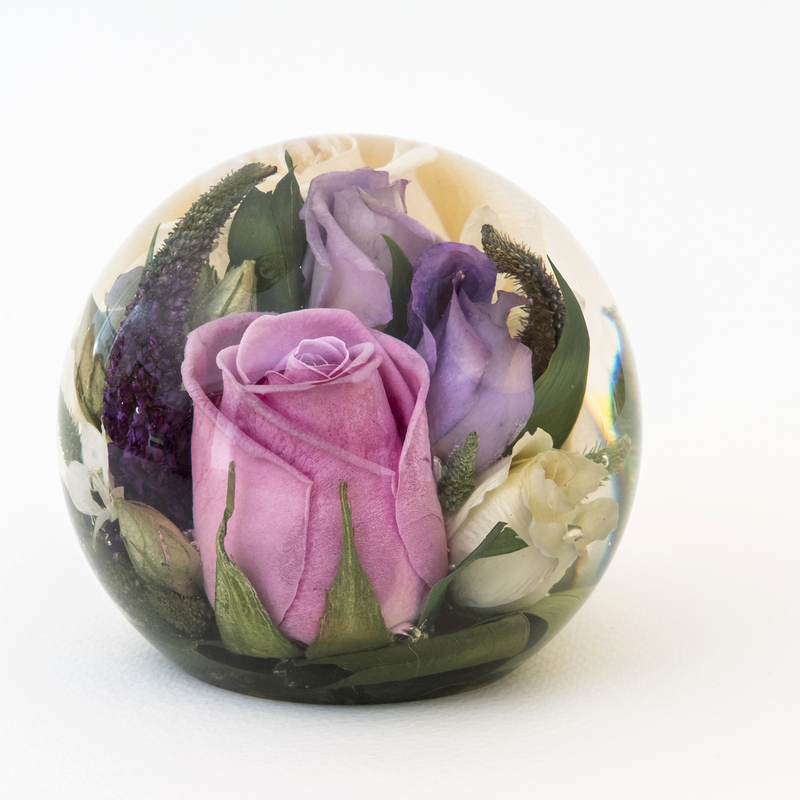 A beautiful 3.5″ design of paperweight encapsulating a variety of smaller flowers . 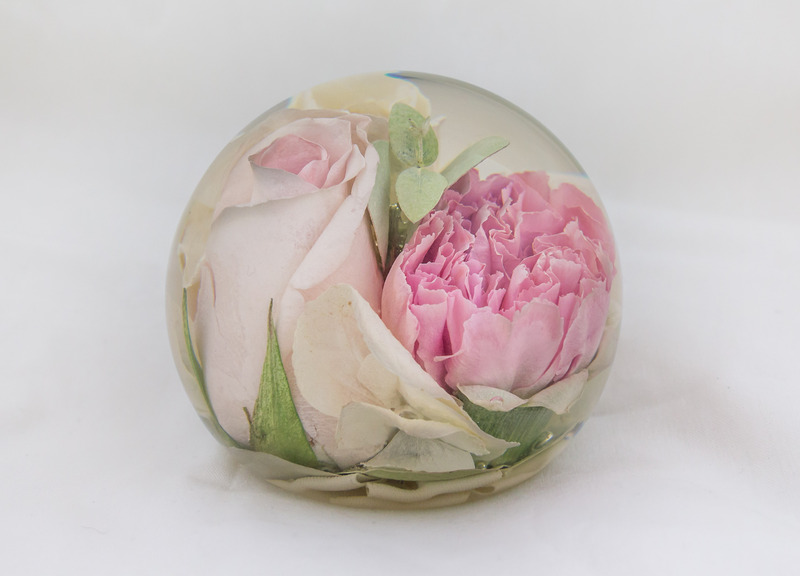 Peonies/Dahlias cannot be enclosed in this size of paperweight but smaller flowers . 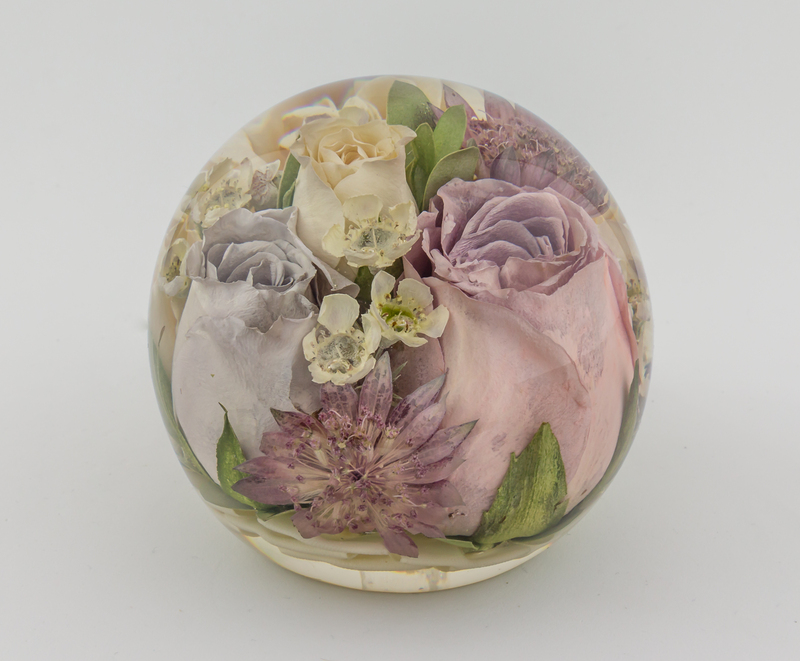 These are our second most popular size of paperweight this Season so far of our stunning range of 3.5″ beautiful multi flower paperweights, made with a selection of assorted flowers and foliage enclosing a variation of colour shades and varieties of flowers. 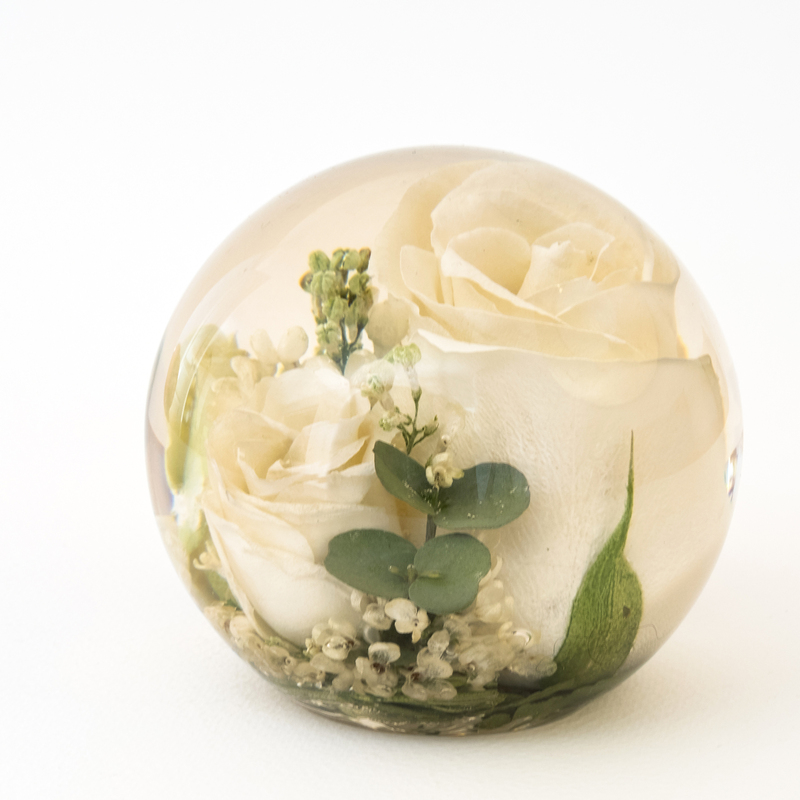 When packaging your flowers ,please remember to enclose some foliage as well if possible as this will enhance the beauty of your paperweight (some varieties of flowers will need to be reduced in size to enclose the variation together). 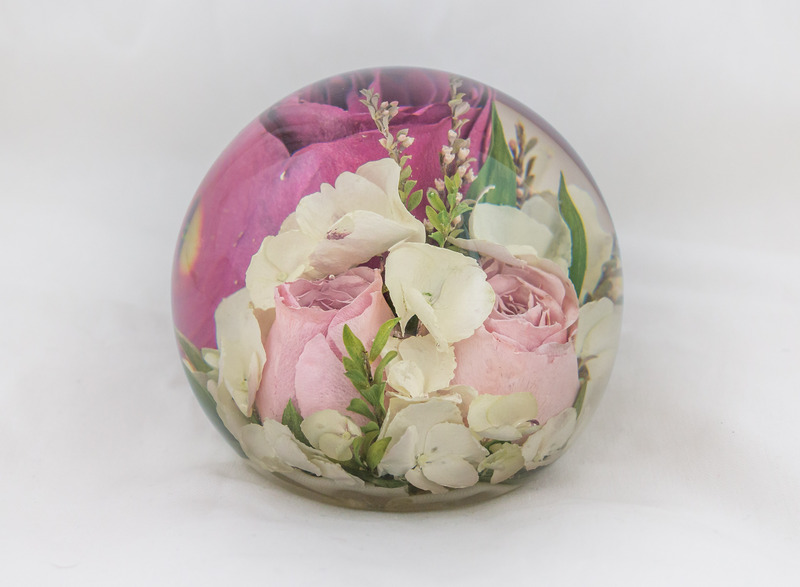 The finished paperweight will be approx 3.5″ when completed and the images here are a guide of how some paperweights have been made , so as your flowers will be different , the paperweight will be created to compliment the flowers provided. 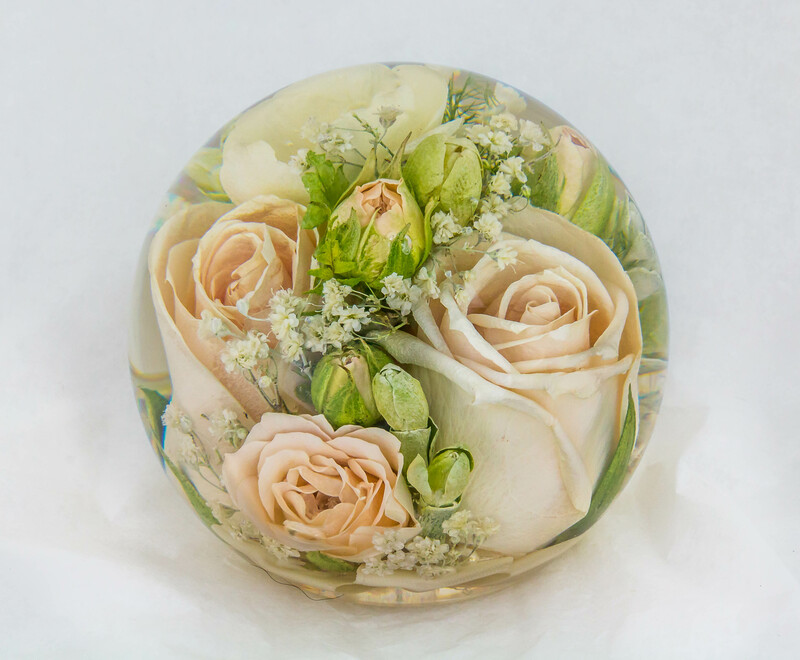 All our paperweights are made by hand and a paperweight is designed with the various selection of flowers provided to us, so the flowers enclosed within the paperweight will be at the head designers discretion. Hello! Arrived – it looks stunning. I wish I’d ordered more 🙂 truly beautiful. Thank you! 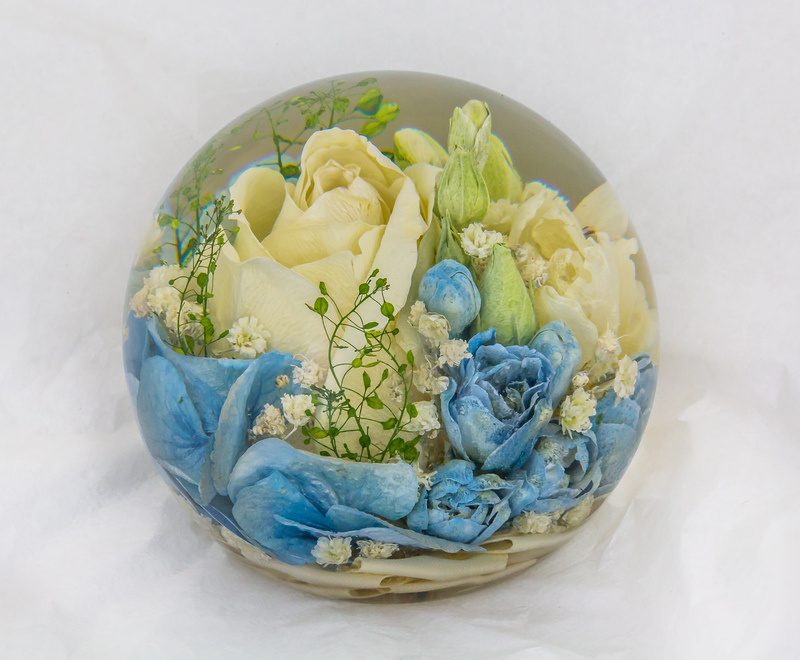 I received my paperweight today and oh my word it’s absolutely beautiful thank you so much and well worth the wait. You have done such an amazing job. Thank you soo much for the paperweight!! It’s absolutely beautiful and I love it. It brought a tear to my eye when I opened it. I will definitely recommend you to everyone. 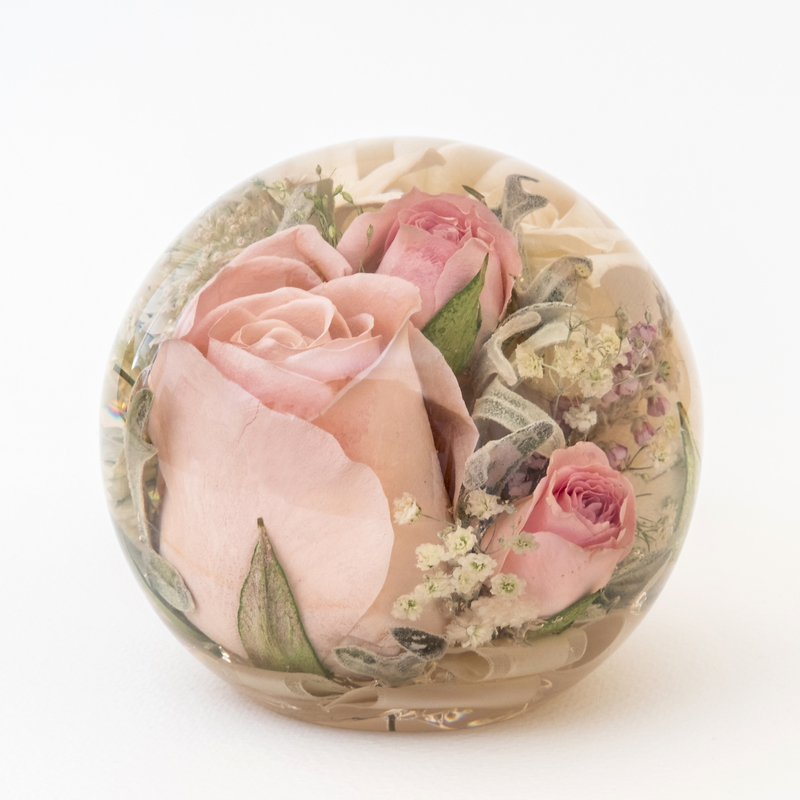 Just to say the beautiful paperweight arrived in perfect condition a few minutes ago, as promised. My son and his new wife will be thrilled! 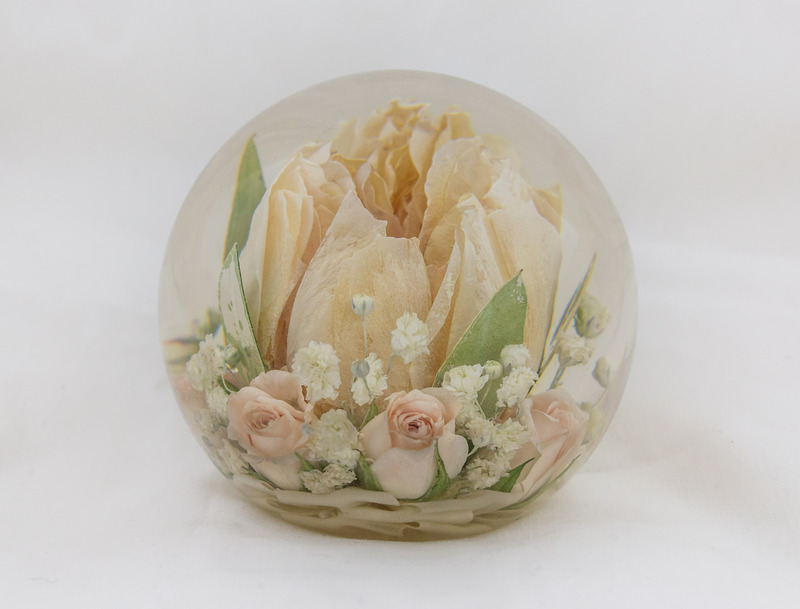 I’m at a complete loss as to how you manage to encapsulate such delicate blooms so brilliantly with naturalness preserved! Hi Rachel. 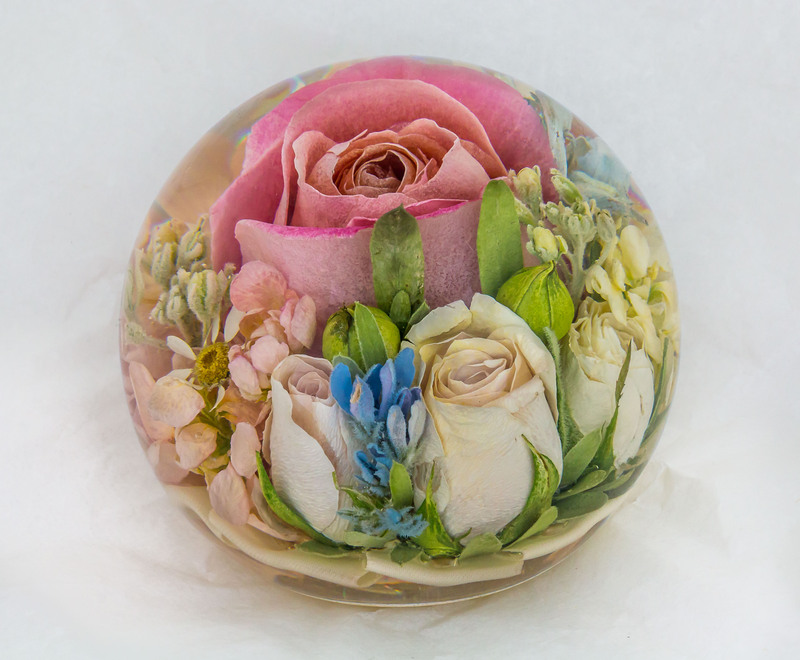 My daughter delivered our beautiful paperweight at the weekend. 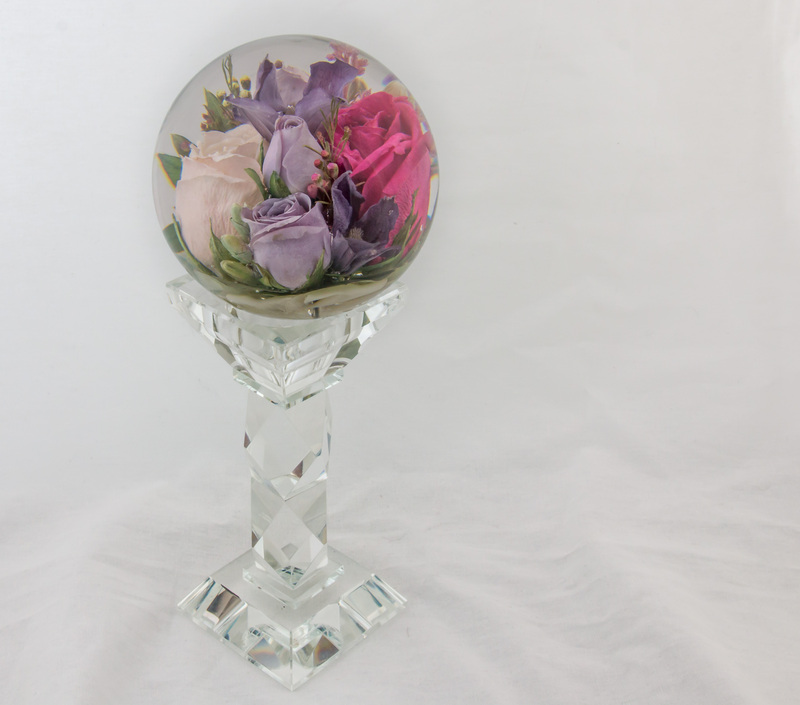 It is stunning, we are so pleased with such a lovely keepsake of our special day. Thank you so much, Lyn and Andy Woodward. 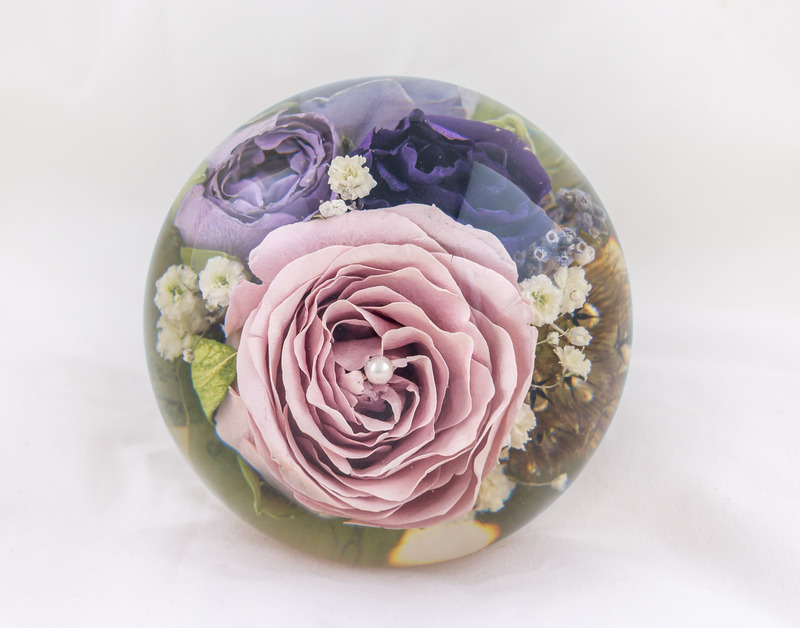 We would like to thank everyone involved in putting together the beautiful paper weight which contains a selection of our daughter’s flowers from her wedding bouquet,she is thrilled as are we with the result,the service,delivery and keeping us informed of the progress was excellent,We will certainly be recommending your service to others. Lovely thank you, it has arrived and I love it! My order arrived at 12.30pm today thank you – it’s perfect! My order arrived this morning. The paper weight looks wonderful. Many thanks to you all for all your help and assistance from placing the order to delivery. It will make a treasured memory for my daughter and son-in-law. 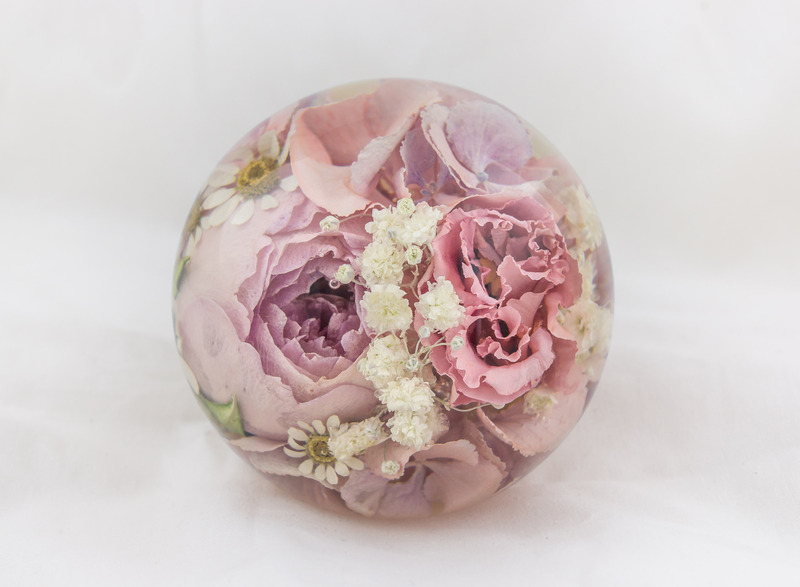 Just to let you know my paperweight has arrived, it’s beautiful, I love it, thank you so much. Hi there, just to confirm it has all been received and it is amazing! We are over the moon with what you have done. Please pass on our thanks to everyone involved. It’s arrived and it’s perfect! 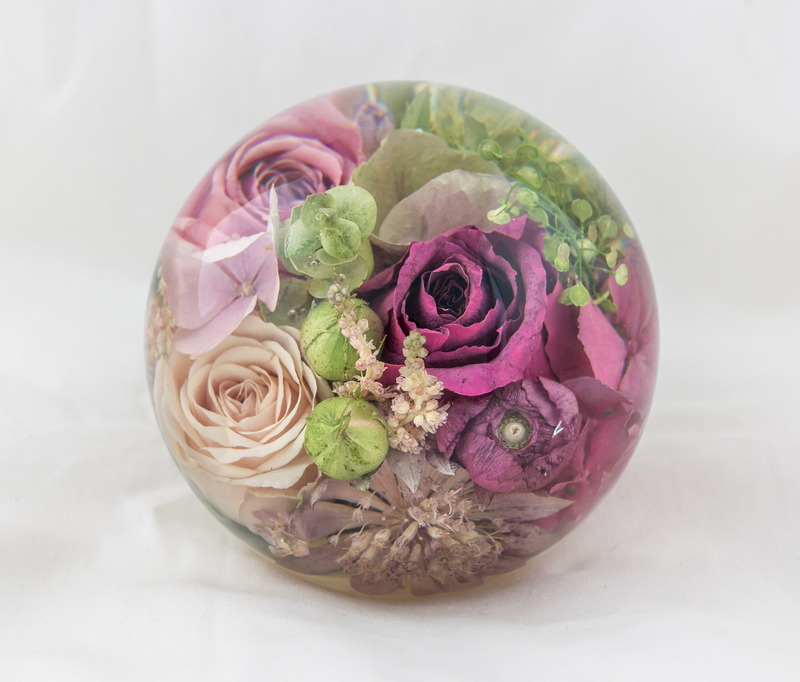 Just to let you know my paperweight has arrived and it’s lovely. Thank you so much. Just to say the paperweight has arrived safely. It looks fantastic, thank you very much. Flower weight received and I absolutely love it. It’s amazing! 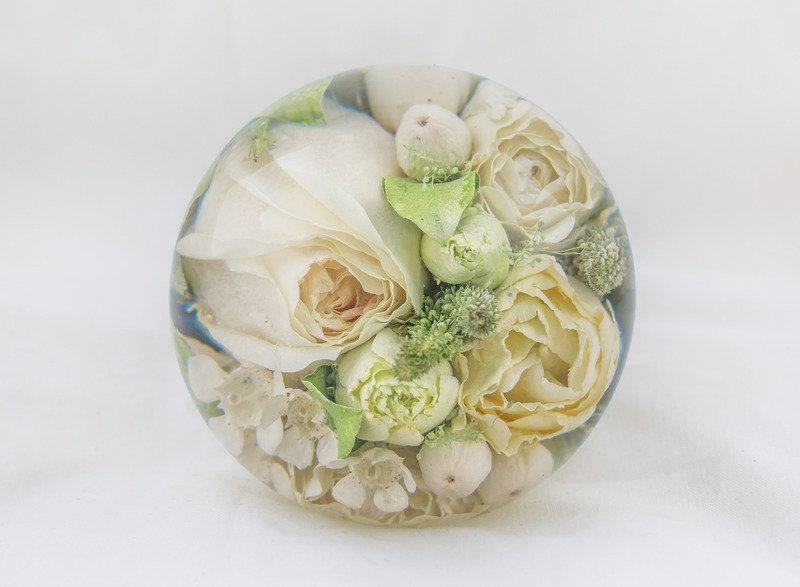 Thank you so much for the paperweights which arrived safely. We are delighted with them, well worth waiting for. 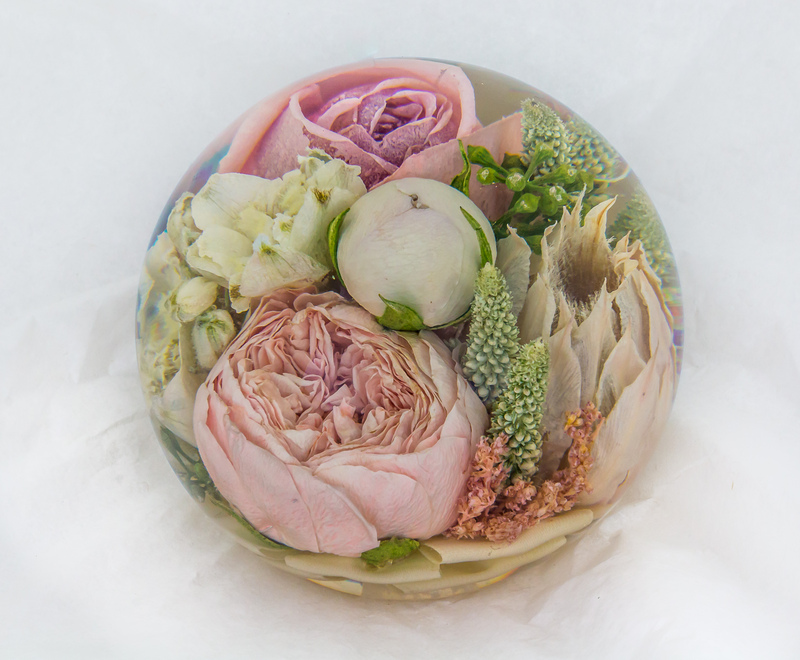 I received my paperweight not long ago and it’s absolutely stunning couldn’t have been more perfect. 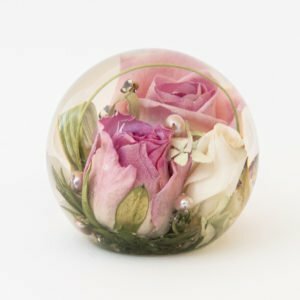 Cannot recommend this place enough, such a unique way to have your flowers preserved. Definitely recommend. Received all good thank you. I received the flowers this morning and just wanted to drop you a line to thank you so much!! They look absolutely fantastic and I’m so grateful for all the work you have put in. 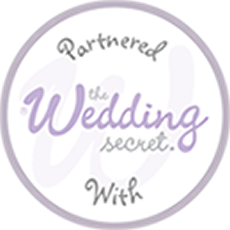 I will absolutely recommend you to my friends who are getting married next year!! 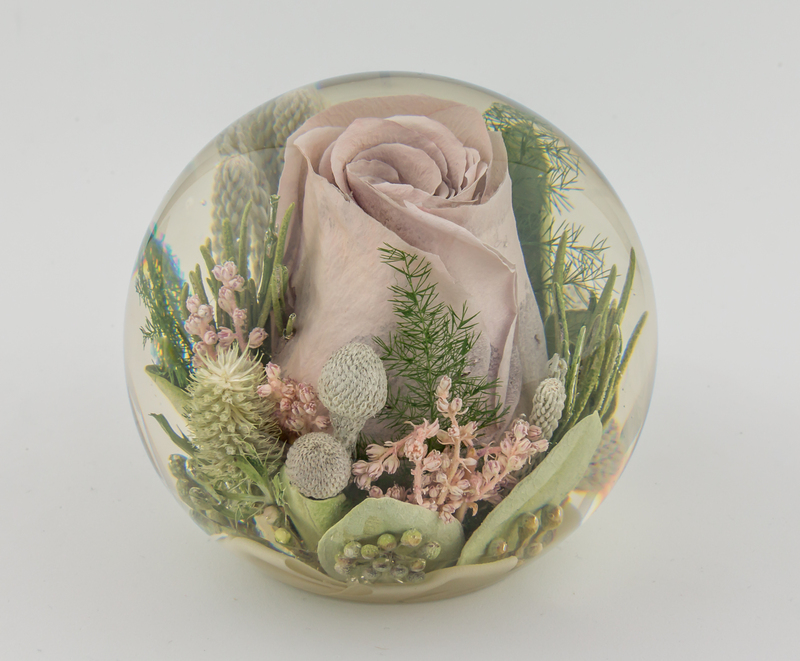 Just to let you know I have received my paperweight and it is beautiful. I look forward to surprising my daughter with it. 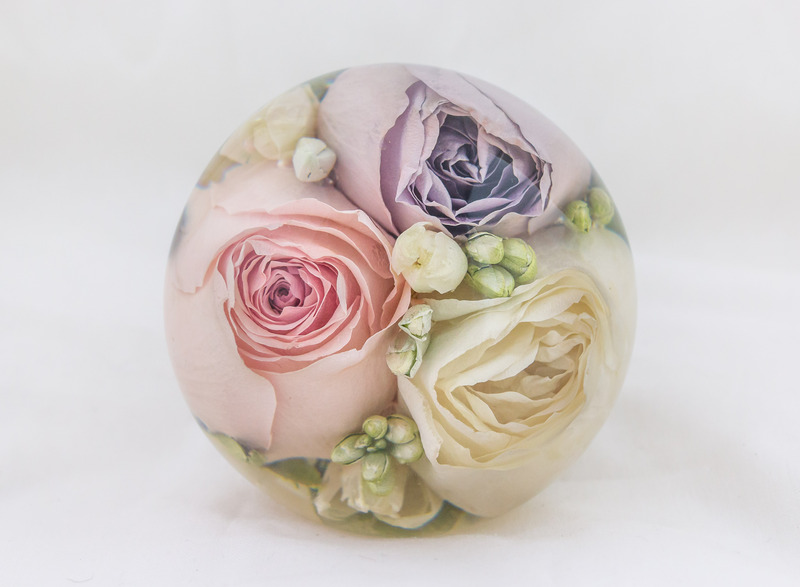 Just to confirm the paperweight has arrived and it really is gorgeous. My daughter will be so pleased with it when she receives it. Unfortunately she lives in Hong Kong, so it will have to wait until I am there in March. I certainly don’t want to loose it in the post . Thank you once again and be assured I will recommend you to all my friends for their daughters. 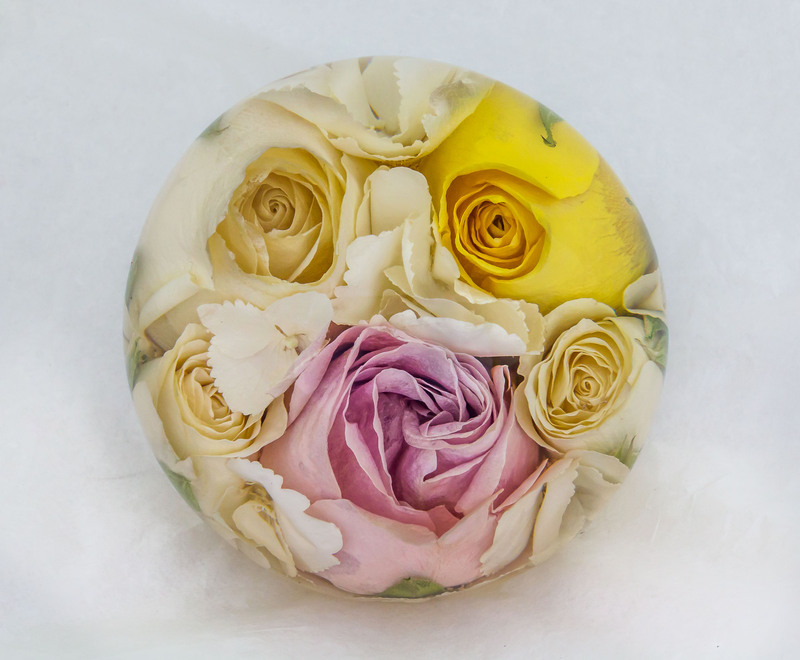 My daughter received her wedding bouquet paper weight today. It is truly beautiful and she is absolutely thrilled with it. 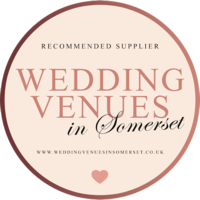 We will be recommending you to any future brides! The paperweight arrived today. So elegantly packed I daren’t open it to peep! Thanks for your efficient service. I will be passing it on soon so it can make its way to Portugal. 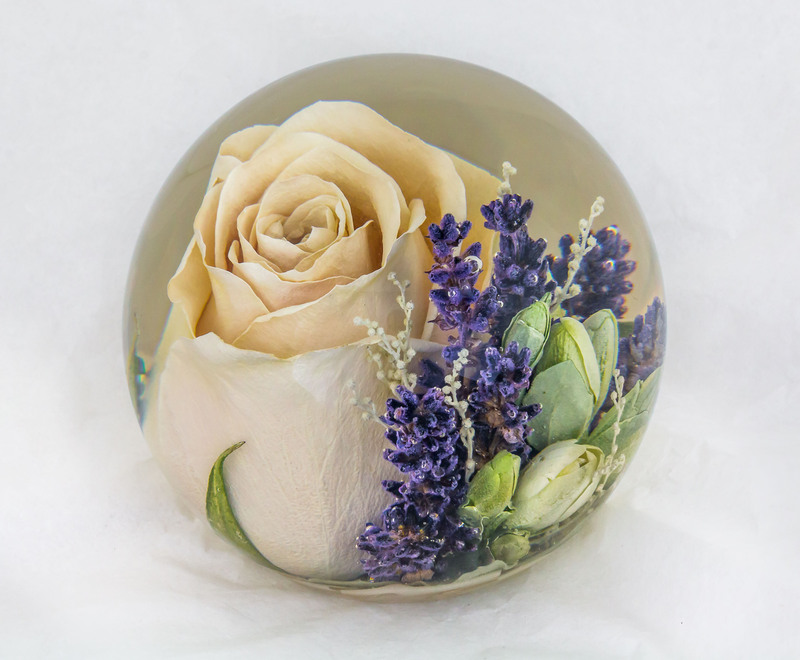 I just wanted to thank you very much for the paperweight received today. It is absolutely gorgeous and the perfect colour and rose, we love it thank you so much for doing another one for us it is very much appreciated. A perfect accessory to sit next to our wedding photograph. Thank you and a very Happy Christmas. Well what can l say – simply breathtaking and totally beyond our expectations . 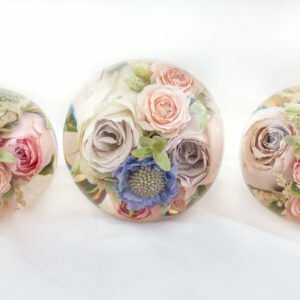 From start to finish your service and level of customer care has been brilliant – we were sceptical buying online but we can honestly say we have been overwhelmed by the quality of our adorable paperweights . 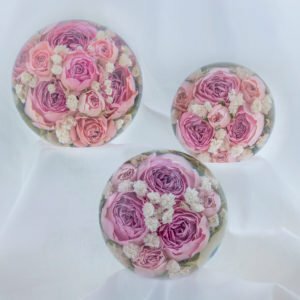 Our niece ordered from a less reputable company shall l say and their paperweights are horrendous ( so sorry to write such a hard word ) but they truly are – they were the bridesmaids flowers . We are so so happy that we chose your company that had experience and a valued high reputation . You have exceeded so highly you so thank you and all your team who made us the most wonderful paperweights we can treasure forever and ever. Best wishes for 2019 and beyond you deserve it! Thank you. The paper weight arrived this morning, and is absolutely beautiful. Please pass on our thanks to the team that worked on it, they have done an amazing job. In certain lights it looks like you can touch the flowers, the arrangement is perfect. It is well worth the money. 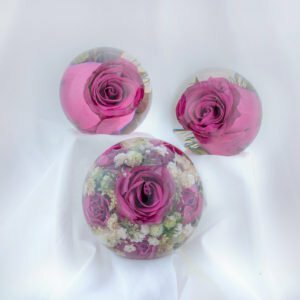 I just got the flower thank you so much it looks great my sister is going to love it will give it to her as a first anniversary pressie! If I ever get married I will be back to you!!!! I’ve received my order today, thank you so much it is absolutely beautiful! I am so pleased with it, it has really surpassed my expectations! 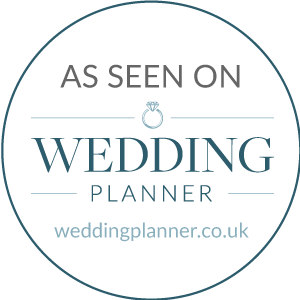 I don’t use social media, but will leave you a review on your website and I have already been showing it off and recommending you to friends and family! Absolutely thrilled with the product, it has surpassed my expectations! The detail is amazing and is even better in real life than the beautiful photos of products here on the website. 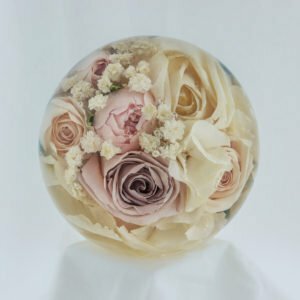 I was so happy with my bouquet on the wedding day and now I have something I can treasure forever. 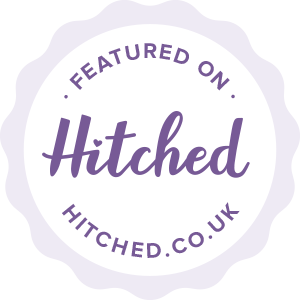 The service and contact from the team was very reassuring in that I received messages to say my flowers had been received and updates along the way, as well as delivery date options. Highly recommended, such good value for money for what is now such a precious keepsake. I will definitely be doing this again for my eldest daughter who is getting married in May of this year. 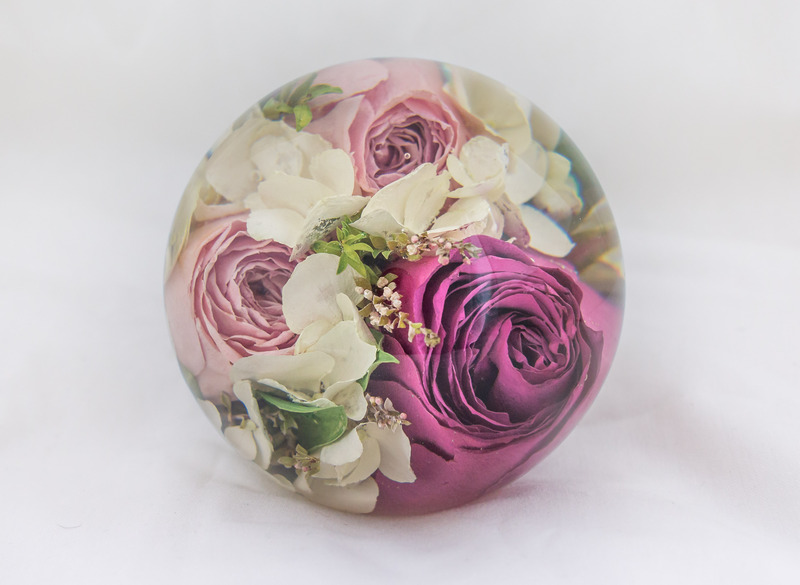 Thank you so much for my paperweight it is absolutely stunning. Arrived safely yesterday. Just wanted to say that the flowers are even more beautiful than we were expecting them to be! A real revelation as to the detail that can be seen and an absolutely amazing memory of the day. Please do pass along our thanks to the team for taking such care and dedication with this work.